Predictions about a summit window on Annapurna at the end of this week didn’t materialize, as snow and wind restrict all teams to Base Camp. Predictions about a summit window on Annapurna at the end of this week didn’t materialize, as snow and wind restrict all teams to Base Camp. With forecast of more bad weather days, summit push party will have to wait for a while. 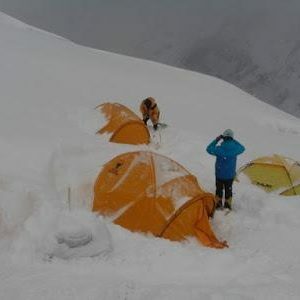 Meanwhile, few other climbers are trying to go forth with acclimatization plan. 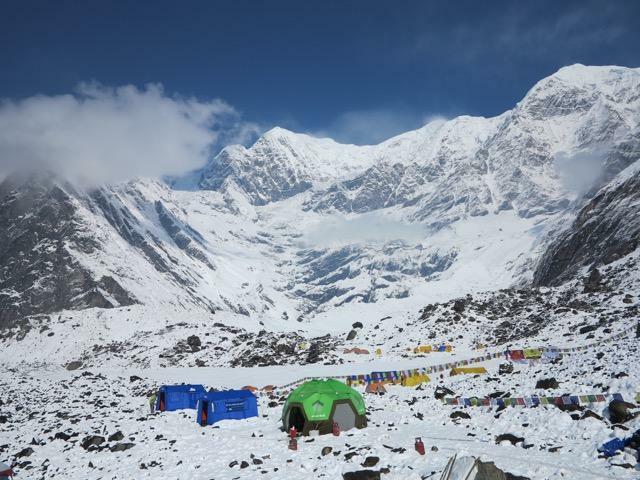 “Annapurna becomes a particularly ‘challenging’ mountain if the slopes get loaded with snow since the majority of the route to the summit is highly avalanche prone. So, once we see a clear window where snow stops and the sun shines, we still have to wait to hear avalanches and/or for the snow to consolidate (the slopes decide which). Then, we move up again.” Chris Burke wrote on her blog. 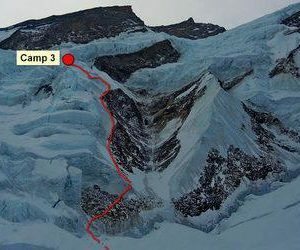 Her team spent a night in C2 last week and was considering possibility of summit push if weather window showed up this week. Bad weather has also halted rope-fixing for now. 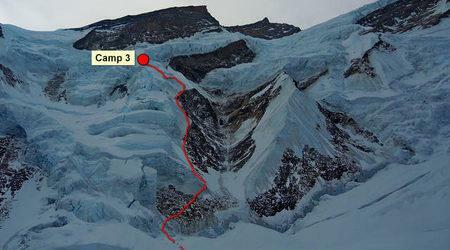 As mentioned in previous report, the usual passage from C2 to C3 is broken due to a huge, unpassable crevasse. Sherpa, instead, opted to find a new path on right side. There is a section of this route right under the range of massive hanging Seracs, which may release at any time. 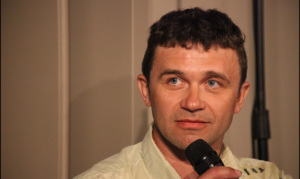 Some climbers, like Romanian Alex Gavan, deem it too dangerous to climb, but there isn’t any viable alternative. The riddle, thus, stands unsolved at the moment. Bulgarian Boyan Petrov was one of the climbers who reached lower C3 (at around 6400m) on March 26th. “I saw around 10 people struggling with the route. They went to the edge of the enormous funnel from which we saw over 20-30 cubic meters of ice and stones poured, yesterday afternoon. I hung on to the rope (old passage) and started a technical climb up rocks that were tilted at around 60 degrees for 40 meters, with ice. Soon I caught up with rope fixing team, but the track was too technical. I passed them without risk though.” Apart from being lower in altitude, the campsite at 6400m is barely wide enough to accommodate 3-4 tents. While some early birds trek towards mountains, majority of spring climbers are still in Kathmandu. 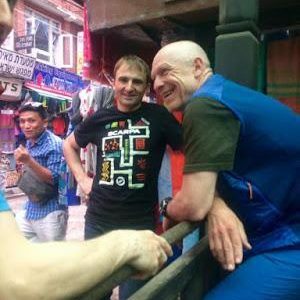 Climber and fellow blogger, Alan Arnette, arrived in Nepali capital couple of days ago and noticed a difference, “I arrived in Nepal and immediately felt something was different. The normal crazy drive from the airport to the hotel was, well, almost relaxing. 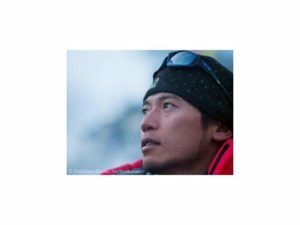 Traffic was reasonable, drivers almost polite … Kathmandu has changed.” Alan, who himself will be climbing Lhotse, thinks there will be slightly lesser team than usual on Everest/Lhotse. Shisha Pangma and Manaslu new route teams had a brief talk in Kathmandu, yesterday, before heading towards mountains. 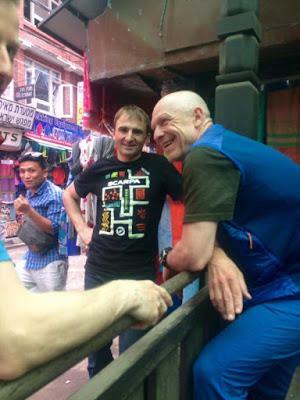 Shisha Pangma South Face team, Ueli Steck and David Gottler, are flying to Lukla today. 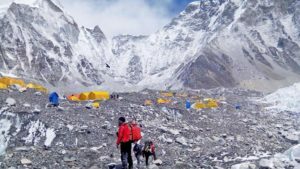 They intend to acclimatize in Khumbu valley for two weeks, before going to Tibet. Peter Hamor, Horia Colibasanu and Michal Gabriš will start trek to Tsum Valley and Manaslu, today. 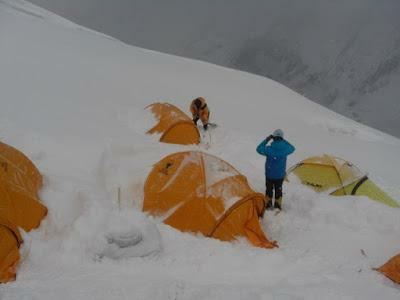 They will acclimatize on Manaslu normal route, before attempting the full North Ridge. Video: Nepal Himalayas from 20,000 ft.